Domestic Divas Blog: Food & Wine Magazine Names Best New Chefs! As I've been blogging, Animal is one of the best restaurants in LA right now. Soon after they opened, I had my first meal there and I loved it so much, I went back three times that week. In fact, just last Friday, I ate at Animal with Kuzak's brother and the Chicago Foodie, munching on my favorite dish: quail fry. Well, lo and behold, my favorite magazine not focused on celebrity's personal lives, Food & Wine, has just named Vinny Dotolo and Jon Shook Best New Chefs 2009. 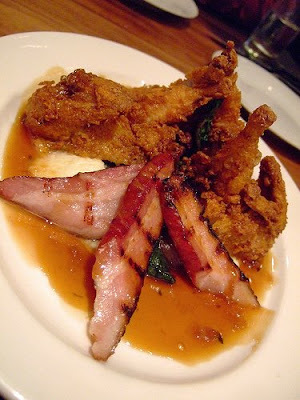 In their write up, they also point to the quail fry as their favorite dish. Congrats to them both, and you can bet I'll be going back for more! Click here to read my review of Animal! Nice. Their poutine was good too! Yes, that was delicious. I wish I was eating it right now!